For a human being death is as imminent an occurrence, as it is a great unknown. Death constitutes the core of religion and its rituals, the central subject of philosophical reflection and moral judgment, the subject for creations of artistic imagination. Human attitude towards death as an event belonging to two different orders of life – the order of nature and the order of culture – is in a state of permanent change. Old cultures showed more courage when dealing with the fact of dying. They created a model of „familiar death” – people died at home, surrounded by their next of kin, reconciled with the fact of dying. The nineteenth century brought this traditional model of dying to a collapse. The relation between the moribund person and its surrounding social environment has changed. It can be said that a characteristic „hospital style” of dying was introduced: the process of dying has been in a sense hidden in the rooms of the hospitals. The phenomenon of avoiding speaking and thinking about death was given the name of „death crisis”. Its manifestation is found in removing death from the scene of public life. Death became a taboo-subject for a human, as if it was nonexistent. Consciousness of one’s own moribundity becomes, as a rule, suppressed. The process of dying in itself is not only an existential experience, but also a spiritual one. Man is forced by it to confront himself with God or with „nothingness” (when he rejects God) and to face his own life by finding its sense and value. This confrontation becomes more and more difficult, since the generation of people reaching now maturity is not familiar with the presence of death. They have not lived through the nightmare of war and they do not partake in the mystery of death of their close family members. All this makes for the fact that death, burial rituals and cemeteries become strange phenomena and fall into oblivion. The modern man has lost the ability to suffer. He flees the conscious process of dying. Promoted is youth and vitality, whereas old age, which comes together with death, makes an uncomfortable reality. Dying in a hospital relieves the man from thinking of death, but at the same time it brings discomfort, anxiety and fear of death. More and more people today want to die as quickly as possible, feeling no pain, not even feeling anything – preferably under anesthetic or while being asleep. This attitude opens today the door for euthanasia. Euthanasia means death at request – quick, easy, without pain and suffering. Mass culture obscures and fudges the final meaning of individual death and treats it as a private problem of the dying person. Media do not show dying people, departing and saying farewell to the world. In a civilization which values freedom and success, vitality and life energy, death – if it may not be defeated , must be ignored. Death is regarded as a phenomenon which concerns everybody around me, not me myself. 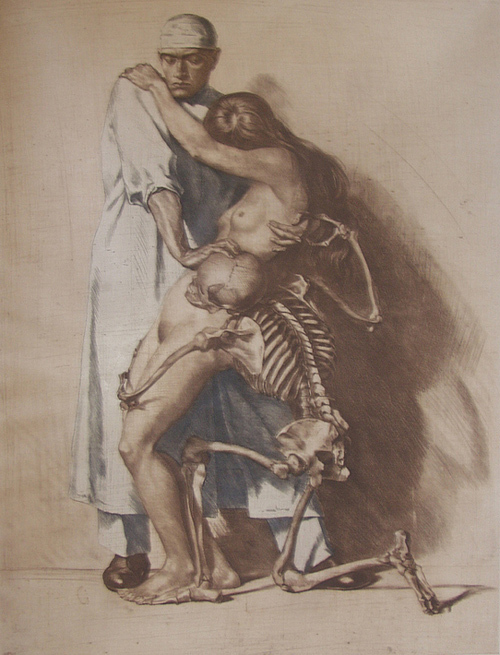 Mass media create in the mind of the modern man a distorted picture of death – „death devoid of reality”. All the violence present on television and in film productions, in computer games – all of it results with death becoming an anonymous and mechanical process and even a kind of entertainment. Finally we are unable to cope with real death. The exposition Mors ianua vitae (Death as Gates to Life). Christian burial customs aims at showing a piece of truth about death by showing objects which accompanied dying, pictured it or had a relation to it at the time when it was still an inherent part of life. The intention of the exposition aimed by the authors was to show the historical heritage of Warmia and Masury. This is the reason for presenting – beside the narration, which concentrates on the funeral rites of the Roman Catholic Church – relics related to the burial practices of the Evangelical-Augsburg Church. The burial rite in its main features is similar in both Churches: final farewell, mass in the church and the place of burial, but the theological explanation of the Last Things differs in both confessions. It is enough to mention the prayer for the dead, the Holy Mass offered for the dead and also the theology of the Purgatory and of the Last Judgment. The comparison of theology of Last Things in the Catholic and Lutheran confessions was deliberately omitted. The attention concentrates on presenting the artistic heritage of both confessions by showing what is typical for the Catholics – chasubles, silversmith ware for holding the sacraments of the sick, altars and also all that is typical of Lutherans – the way of memorizing the dead: cemeteries, epitaphs, funeral banners. We can notice the preponderance of relics related to the Catholic sacral art in comparison with the Lutheran sepulchral art, but this fact is justified by the much more developed Catholic theology of the Last Things: death, Purgatory, Hell, Last Judgment, Communion of Saints, offer of the Holy Mass – all this finds its expression in paintings, sculpture, fabrics and goldsmith’s craft. The exposition leads the guest from the moment of Christ’s death, which Christians understand as the Gate of Life, through the chronology of the death of martyrs for faith, to the death of an individual, which puts an end to the biological life of the physical body and frees the soul. From now on we are led on two separate ways – one for the body (funerary rituals, the burial and its commemoration) – and one for the soul, unto the Last Things, such as: Heaven and Hell and the Last Judgment. Each of these stages is documented by historical objects, chosen deliberately from different ages: chronologically speaking the time-scope of the exhibition is closed between the end of 15th century and the beginning of the 20th. Although during that time funeral customs were changing – the stages of the last way of the dead remained unchanged. Presented objects originate mainly from the Warmia and Mazury region, but also from Pomerania and Silesia. They come in the first line from the sacral objects, such as churches, monasteries, parochial parishes, and churchly institutions. This was also a deliberate choice made under the influence of the hitherto collaboration between the Nicolas Copernicus Museum in Frombork and the Museum of the Warmia Archdiocese in Olsztyn, which effects now in a third joined exhibition showing the treasures of the Warmia Archdiocese. 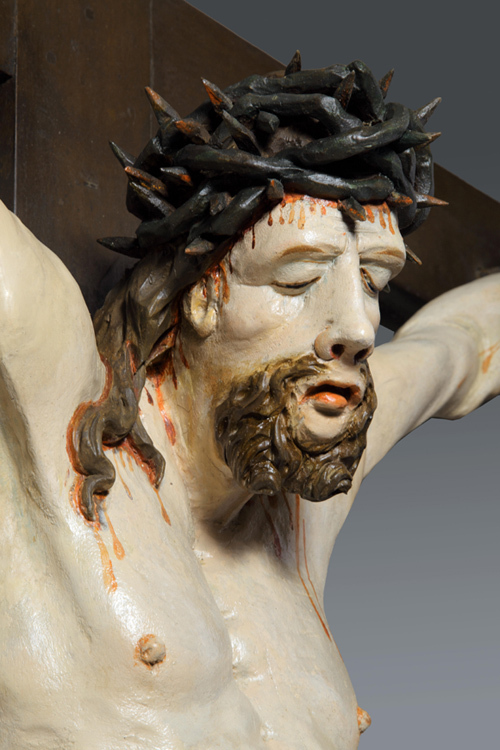 Crucifix fragment dated around 1700 . The exhibition is replenished by objects from the collections of the Frombork Museum and the Wojciech Kętrzyński Museum in Kętrzyn. 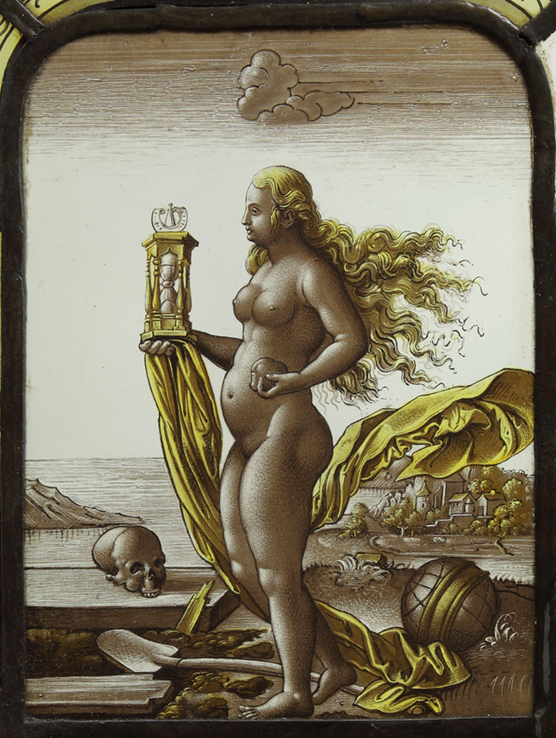 The latter possesses some unique objects of sepulchral art. A separate complex is formed by relics delivered by „death archaeology”, as an effect of archaeological excavations, which were led by Dr. Małgorzata Grupa from the Institute of Archaeology at the Nicolas Copernicus University in Toruń. 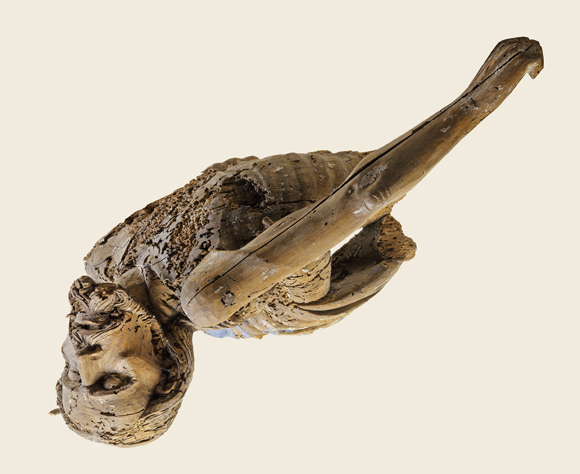 This complex comprises grave goods coming from the 17th and 18th centuries, such as i.e. 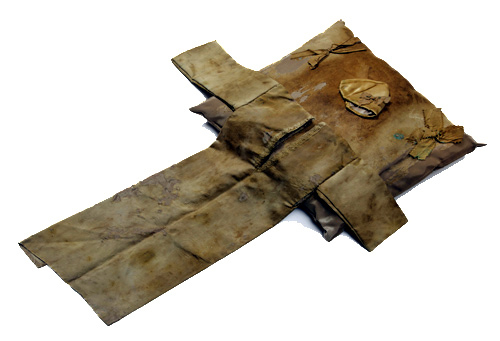 burial clothing (of a newborn, of a child, of an adult and also of a priest). We are showing objects of high artistic quality, as well as those of everyday use – average objects of material culture. With no doubt as an outstanding piece of art we may consider a 17th century painting from a chapter house of the Frombork Cathedral, depicting an Angel Pieta, or an impressive cross from the year 1700, belonging to the Church of the Visitation of the Blessed Virgin Mary in Błudowo. 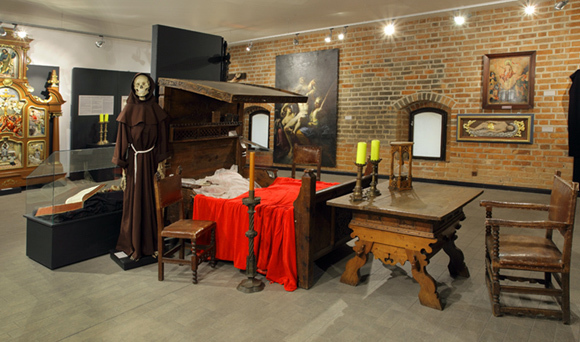 Unique, and not only on Polish scale, is the gothic bed from the beginning of the 16th century. During the 500 years of its using not one life has been ended in it. Unusual exhibits are the two 19th century coffins from the St. Stanislaus Church in Waplewo and St. Catherine Church in Brąswałd, which were destined in the past for a place of „eternal piece” and only under dramatic coincidences could see daylight again. 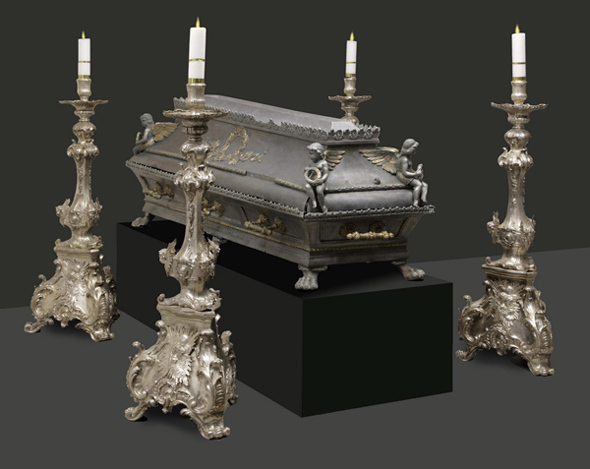 The exhibition presents also objects which – due to their size – are not commonly exposed in the museums, such as altars: from the St. John the Baptist Church in Jonków, dated to the beginning of the 20th century, containing an interpretation of the Christian doctrine of death, as well as the unique 18th century altar dated 1735, from the Frombork Cathedral Savior’s Chapel (the urial chapel of bishop Krzysztof Szembek and of the four other following bishops of Warmia). Our attention is also drawn by a collection of good-quality Baroque coffin portraits (from a private collection and from the St. Maria Magdalena Church in Kalwa) and by some unique funeral banners from the Kętrzyn Museum collection. Our special attention deserves also a huge 17th century painting depicting the Last Judgment, which was lend to us by the St. Ursula Church in Lichnowe. The evangelical community was of great importance for the regions which mark the territorial frames of this exhibition, so objects originating from Evangelical churches take an important place in this collection – funeral banners, coffin portraits and coffin metal plates, epitaphs, tombstones and even one coffin and one urn. In place of an opening poster the exhibition opens with a fragment of an epitaph from an Evangelical church in Pasym. It refers to the decoration of the St. Elisabeth Garrison Church gates in Wrocław. Those gates, which once lead to the cemetery, are crowned by a cartouche held by putti and bearing an inscription: Mors ianua vitae. 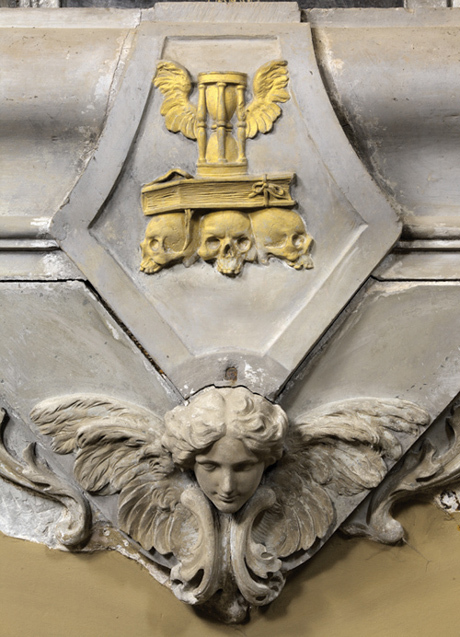 A detail from an epitaph commemorating canon Adam Zygmunt Konarski became our graphical sign (1685.). 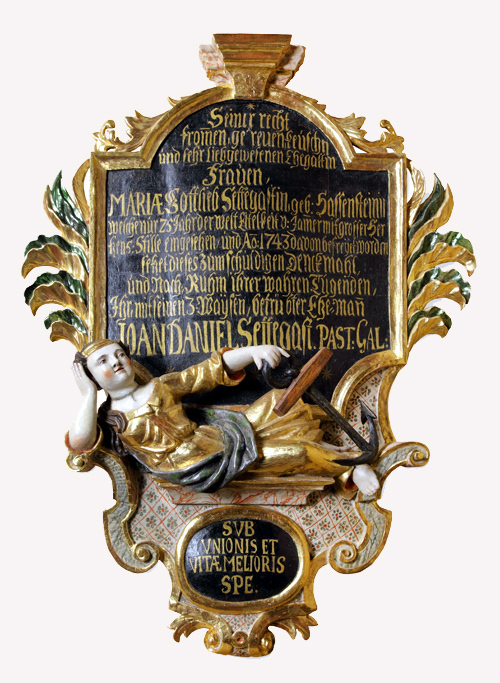 It may be found in the Archcathedral Basilica of the Assumption of the Blessed Virgin Mary in Frombork. It depicts, in a very condensed form, the essence of our human existence, but gives also a place to reflection, which is the aim of the exhibition organizers. This emblem, showing three human skulls which carry a book and a winged hour-glass, tells us that death creates the basis of our worldly existence and the book of mundane life will soon be closed as soon as our rapidly passing time is over. All exhibits were borrowed from churches and churchly institutions of the Warmia archdiocese, Elbląg diocese and Toruń diocese, also from museums and private collectors. Fr. Dr. Jacek Maciej Wojtkowski – Director of the Warmia Archdiocese Museum. dr Jowita Jagla – Chair of Art. History of the Łódź University. Photography by: Bożena and Lech Okońscy.